I haven’t decided how I should write this interview. Should it be formal? Should it be artistically informal? I don’t know! …and do you know why? Because Tolis is 60 years old, but I felt like I was talking to a young and passionate scenographer. Despite his stature as an established designer (he was awarded the UNESCO prize for “Creativity & Innovation” in 1999) he is excited by projects such as sceno.org. Finally, because Tolis and I talked for so long about scenography, PQ and Scenofest, whilst eating souvlakia and drinking ouzo under the Acropolis like I would have done with any of my friends. It was Saturday morning when I arrived in Athens. I took a little tour of the book stores looking at theatre and scenography books. They were very expensive, a book that I liked cost 83 euros! I also looked at some theatres. Athens is full of theatres showing lots of interesting plays! After my walk in Plaka (under the Acropolis) Tolis sent me a message on my mobile “I am on the train at last! Where shall we meet?” I first thought of a small cafe I know, but I was in the mood for a dozen of souvlakia and a couple of glasses of ouzo, so I asked Tolis, “Are you hungry? He replied, “Let’s meet at Monastiraki, at the tavern with souvlakia”. And so there I was waiting for Tolis. 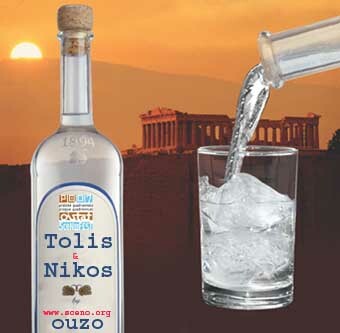 In the tavern surrounded by pictures of famous Greek actors and directors that had visited the place years ago, the smell of souvlakia, ouzo and retsina wine floating around the room tempted me to order before Tolis arrived. I picked a table outside and looked over the menu for a while trying to ignore the eager waiter who stood by my shoulder. Tolis soon arrived, searching for me amongst the other diners. I raised my arm, “Nice to meet you at last”. I was so happy to meet him, not least because the eager waiter could finally take our order. If you were in a corner looking at us, you could see Tolis and I smiling for our meeting and the waiter smiling for his reasons! Souvlakia and ouzo arrived at our table and our talk of scenography, PQ and scenofest had just begun when I remembered that I had a gift for him. A gift that I wasn’t sure was appropriate for our meeting. I handed Tolis a fabric bag with Greek letters on it. I told him that it was a cult present full of humour. He liked the bag and opened his present with a smile. “Thank god he is smiling!” I said to myself as he was looking at my present! 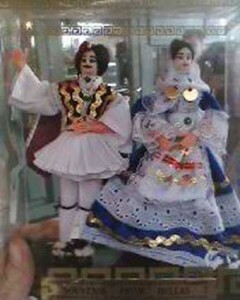 I had given him a traditional Greek doll of `Tsolias and his wife’. “My wife will love it!” he said, and from the look in his eyes I realised he liked it too. 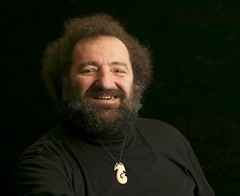 In 1999 Tolis returned to the Prague Quadrennial, this time as a member of the New Zealand exhibition delegation where he won the UNESCO prize for “Creativity & Innovation”. I wanted to ask Tolis what is it like to be an international scenographer and to work with different people and cultures? “Well, this is exactly the major reason I left Greece all those years back. I wanted to work with other people and in other cultures. I must say that I’ve got my wish to the full, and, thankfully there seems to be no limit, yet! One of the characteristics of the body of my work is that a large part of it is indigenous. For example, Maori, European New Zealand, Chinese New Zealand, Aboriginal, Australian etc; work immediate and contemporary to the places I was working and living in. Coming from a culture that has been appropriated to an almost total degree, and having lived for quite some time alongside other cultures that are constantly in danger of being absorbed and obliterated, has created a feeling of understanding and respect for other cultures. I sort of feel that I am allowed to enter into a treasure trove of everything each time I work on a piece not from the Greek culture. It may sound romantic but there is something wonderful in trying to understand and present another culture, and not appropriate it without a “by your leave”. Are you influenced by the Greek culture modern or ancient and which one do you prefer? We finished our lunch and went for two cups of Greek coffee near “Plaka” (still under the Acropolis). There we continued to talk about scenography, the PQ and Greek theatre. It was a great experience for me to talk with a notable designer like Tolis. We also discussed what it was to be a scenographer but not as you might think! It was not a philosophical discussion, instead we talked about the role, the tasks, the fact that the edges are blurred. We realised that scenographers do a lot, that they are asked to do a lot and that they are capable of doing a lot on a theatre stage. From light design to painting, from sculpture to computer-design and from constructing the set to being able to do just anything that could help the play. Tolis told me he was once asked to join an arts commission to discuss and identify the roles and definition of a number of artistic vocations, so he was working with a painter, a sculptor and so on. As the other members described their work and roles Tolis told them “yes I do that too!” much to the bemusement of the other members, yet when it came to describing the role of a scenographer he found himself unable to describe a consistent method or formula. As well as working in the arts, Tolis has spent time working in education. At one point he was Visiting Professor at the UIW University in San Antonio, Texas, USA, occupying the Amey Freeman Lee Chair for Theatre Arts. Whilst there he helped set up a Multicultural Arts Course and Designed and co-Directed a Multicultural Production. “Young scenographers are great, because they are irreverent. They have the tendency to challenge what seems to them to be conformist. And that’s how it should be”, he tells me. What is your next work about? “Many a bar! many a jazz basement, many a fabulous restaurant, many a wonderful beer garden. Go to Mala Strana and across the Karlov Bridge and they will be there!” he answers with a smile.